Sailors are about to get a taste of what like to have a Marine gunny as their leader. Since the day Gunnery Sgt. Sgt Bothvill Valcin met a commissioned officer at boot camp in 2000, he thought about going mustang. After 13 years in the Corps, a college degree, deployments to the Middle East and Asia, and working with special operations units, something was still missing from the gunny’s life: his commission. The Marine Corps gave him a lot of opportunities, he said, according to a Marine Corps news release. Just not the chance to become an officer, despite several applications. But the Navy did. So the gunny is jumping ship — or onto a ship. He’s joining the Navy. 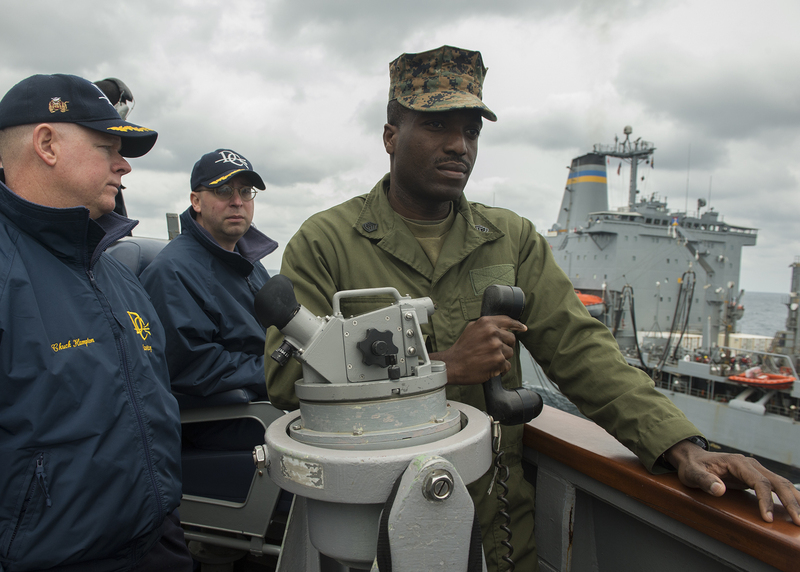 Valcin recently embarked on the destroyer Donald Cook to shadow surface warfare officers as he works towards his commission, the release states. Despite their friendly rivalry, Valcin said he doesn’t feel like he’s starting in a new branch. Congratulations GYSGT Valtin!! Best of luck in your new position. Fair Winds and Following Seas. Congrats Gunny! I went through OCS in Pensacola FL. I have nothing but mad respect for my GYSGT. You have a wealth of knowledge that you can share with the other Naval Officers. I see great things in your future! Best of luck in your future as a fellow Naval Officer! Semper Fi Marine! The Marine Corps dropped the Ball on this one , The USMC should’ve offered him a chance to earn his commission, Congrats Gunny. This is awesome, I’m glad you found way to fill in that empty space in your career. Best of luck to you GYSGT or Sir hope to see you in the fleet! Hooyah! Hopefully not. An Ensign and a Gunnery Sergeant have very different roles and should have very different leadership styles. Thats true…. i tried to get a mecep and ecp in the usmc and they never approved it…. Thanks for the name correction! They got it wrong in the news release. I made the changes in our post. Congrats Gunny. Semper Fi and Fair Winds and Following Seas. May your knowledge and experience help advance you in your career. I wish the Corps would have accepted your request for a Commission. However, thank you for still serving our Great Country. May you long help train our newer generations of our military with such resolve. Semper Fi again brother. I wonder why He was not given the chance to become an Officer while in THE CORPS inspite of his qualifications. Congratulations, I applied for BOOST and for an unknown reason, was turned down. My dream to be a Naval officer never came true for me…and unknown. I envy you and good luck on your new venture! Not surprising. Qualified professional with leadership experience and the USMC says no thank you. Good luck Gunny. Don’t be to hard on them man. Ok, maybe I’m a minority here I know it, however I couldn’t leave my beloved Corps (especially as a GySgt) behind and become an Ensign in the Navy. I fully 100% realize that GySgt probably has legit/personal reasons for doing this, but I just couldn’t. As a retired Marine Gunnery Sergeant I wish you all the luck dealing with your shipmates there former Devil Dawg. Congratulations on your commission Gunnery Sergeant of Marines!!! May God continue to bless you in all you do!!!! Congrats Gunny on your (soon to be ) promotion to Ensign. The Marine Corps sure as hellm failed to take advantage of your skills/leadership. I’m truly surprised that this is tolerated from a GySgt. Go be a squid. Enjoy. Don’t look back. The door is closed. First off, Congrats Brother!! Great Decision The Corp is not the only show in town. Like you I too was a Marine GySgt with 16+ years that also wanted to be a Marine Officer. Turns out in the Corps eyes I was too old to go to OCS and too senior to be a WO, however the Navy welcomed me with arms wide opened and haven’t looked back since. It’s been a year since my commsion I don’t regret any of it. My love and gratitude for the Corp will never wane, its what made me who I am today but not what will define me in the future in my new career as a Naval Officer. Congrats and Semper FI. Better to reign in hell than serve in heaven, I guess. Seriously, best of luck. I’m extremely happy for you. I too was a SNCO after over 11 years of service and became a commissioned officer back in 2011 in the Corps. Best decision I’ve ever made. Your experience will afford you the privilege to become a more well-rounded leader. Don’t listen to any negativity that may come your way from any peers. They have a hidden jealousy that they will most likely never admit to. Gina Harkins – the name is still incorrect in the caption to the picture. Congrats GySgt. As a former Marine thanks for serving. But the Marine Corps is not the only game in town. Best of luck and do great things. Best wishes on the switch from green to white. While I hate to admit it I served under several mustangs and WOs that had forgotten their roots and I pray that you Sir take what your LCPOs and LPOs tell so that you can excell and not discard their advice. Had a shot at commission very early in my career, but have come to believe that retiring as a Gunny was the best move ever.